Ashigaru (literally “light foot”) were so named as they had lighter armour than the Samurai. They also formed the bulk of the armies of the day. Each Samurai was expected to provide two armed Ashigaru. Many of these would be armed with the yari (spear). These are not the pike blocks of contemporary Europe as the Ashigaru were trained to fight in a looser formation, travel quicker and their spear was for slicing and thrusting. Many a battle was won by the Ashigaru, especially if cavalry were foolish enough to attack them from the front. 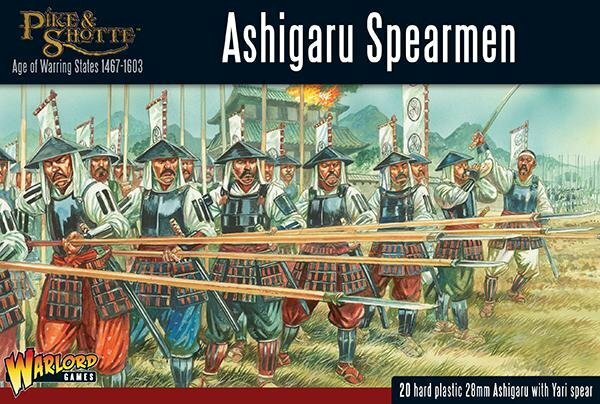 As time went on in the Sengoku (1467-1603) period the proportion of Ashigaru spearmen increased. Their relative ease and speed of training meant they were easier to replace (and cheaper). Marching into battle with drums beating, worn on the backs of troops and beaten by the man behind, and displaying their masters Mon on their sashimono, they would be a formidable sight to behold. Tokugawa Ieyasu, the Shogun that pacified Japan, was himself the son of an Ashigaru.